Farmers say they need more migrant workers to pick crops - because Britons do not have the "work ethic" to do it. National Farmers' Union president Meurig Raymond said many unemployed British people were unwilling to get up in time to start harvesting at 06:00. Without foreign manpower, farmers would have to cut the amount of fruit and vegetables they planted, he said. 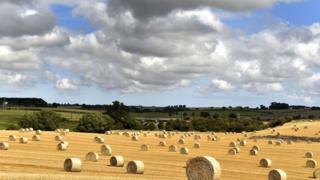 He urged ministers to allow temporary visas for crop pickers from outside the EU to meet demand. The Seasonal Agricultural Workers Scheme, which allowed Bulgarians and Romanians to work for up to six months at a time, was closed last year. Ministers said the gaps could be filled by unemployed people from the UK and EU. But Mr Raymond told the Times: "It's so easy for the government to say the locals, the unemployed, should be involved. "There are some huge cultural issues here. The work ethic isn't what it ought to be. "The whole work ethic and discipline that is required with harvest work needs to be improved a lot in parts of the British workforce. "It's the benefits system and years of inactivity. They will do it for a few days, but they won't continually stick at it. "A lot of farmers are not going to plant next year's crops if they are concerned they are not going [have the workers to] harvest them. It's a huge conundrum." A Home Office spokesman said there were no plans to bring in a new scheme to allow nationals from non-EU countries such as Ukraine, Russia and Turkey to work on UK farms during peak harvest seasons. "The horticultural industry should be able to meet demand for temporary season workers by recruiting within the UK and the rest of the EU," he said. ""The government does not intend to open a new seasonal workers scheme." Mr Raymond said a new scheme would benefit foreign countries because visiting students could take skills back to their homeland. The plea for a "reliable source of migrant labour to the UK horticulture sector" is among a number of demands made by the NFU - which represents 55,000 farmers across England and Wales - in its 2015 manifesto. It also calls for increased speed limits for tractors on public roads, and for the next government to negotiate with the EU to reduce environmental restrictions imposed on farmers as part of the Common Agricultural Policy. It urges promotion of the Britain is Great campaign for British produce to open up export markets, and insists "urgent action must be taken" to tackle bovine TB to stop it spreading into new regions and becoming endemic nationwide. Farmers also want an accelerated rollout of high-speed broadband to all rural areas and to emphasise that "environment and climate change policy needs to go hand in hand with growth in production".